Almost two years ago now, I wrote about a band’s second album and discussed its place in music history. I actually recall having a few conversations about the album after the post—with some music fans agreeing the band is up there with the all-time greats, and some that felt they never had that ‘breakout’ smash hit album or single. Those who believed the latter, give this post a once over. Around the late 1990s, Santana was no longer really a household name. It had been almost a decade since their most recent album release and they hadn’t charted an album since 1982. After a move from UMG to BMG for a label, they and the band thought it would be fun to try something in a bit of a new direction. With Carlos Santana’s guitar chops still recognized as one of the best in the world, they thought it would be a fun idea to do an album with him on every track, and then a special guest to accompany him. Rob Thomas, Dave Matthews, Lauryn Hill, Cee-Lo Green and Eric Clapton highlight just a few names featured. Statistics? Eight Grammy Awards, over THIRTY million copies sold worldwide, number one on the charts in ten countries and the highest-selling album of all time by a band already inducted into the Rock and Roll Hall of Fame prior to release that featured original content. Phew—impressive list. Which album am I talking about? Supernatural was released in June of 1999. Backed by absolute mega-single “Smooth,” the album jumped into the forefront immediately upon release. The follow up single “Maria Maria” would also be a commercial success—which catapulted the album’s early sales. The 28 year gap between number one albums is the longest stretch in history according to the Guinness World Records. Critically many praised the comeback story of Santana, and credited him with reinventing his sound in a way that appealed to a new generation. Some criticized the use of guest vocals on every track, arguing it caused a lack of structure and consistency. Regardless, the album couldn’t have been a bigger hit and with all the accolades, it cemented Santana’s legacy in music history. It gave him that monster single and album he had lacked a bit back in the earlier days. This album time warps me back into the late ‘90s immediately. I can admit when it was initially released, the radio stations in Milwaukee had an oversaturation of the big singles, and I tended to get a bit annoyed by them. But when I’ve put this on in recent years without that bias, I’ve grown to appreciate the diversity and sound the album has. 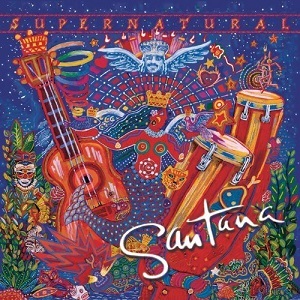 Since it is such a departure from previous Santana works, it can be hard to go from an old album to this—but the one thing that’s incredibly consistent, that signature guitar riff in the background. If you know Santana, you can tell instantly that it’s his song on the radio. I personally love all the cameos—some of them are amazing, some fall a bit flat—but the effort isn’t wasted for me. If it was based on sales alone, this would be the 27th or so best album of all time. I’m not sure I’d give it that high of praise, but it’s incredibly solid. If you like old Santana, I think you’ll enjoy this. If you like ‘90s pop music, a few tracks will be in your wheelhouse. If you like Hispanic rock, this might be your favorite album of all time. It’s a diverse record, and there is no question what it did for Santana’s career and reputation. Give is a listen today since it’s only $5 bucks, and isn’t that too smooth.